Actually for anyone interested in gaining strength, building muscle, and losing fat as fast as possible ranging from elite athletes to ordinary strength enthusiasts. Despite this book being quite mainstream, it’s an interesting read where you can find lots of useful information especially on training for different goals. You’ll also learn Chad’s approach to nutrition and different strategies on how to get lean for a contest or a special event and much more. This book is fully loaded with training programs, precise exercise photos and descriptions and flexible guidelines on how to make it work. It consists of 6 training plans: Get Ready, Get Big, Get Even Bigger, Get Strong, Get Even Stronger and Get Lean. Get Ready is a lead-in plan that will assure that you will be ready for the other plans. Get Big is a plan which concentrates on building as much muscle as possible. Get Even Bigger is a plan where Chad shares his High-Frequency Training technique (which is quite better than in his articles on T-Nation). Get Strong is a plan which concentrates on gaining as much strength as possible. In Get Even Stronger Chad shares advanced techniques in gaining strength. And Get Lean is a plan that emphasizes on fat-loss. Chad uses full-body training in his programs exclusively and explains why. I, as a big believer in full-body training, totally support his ideas on this subject. 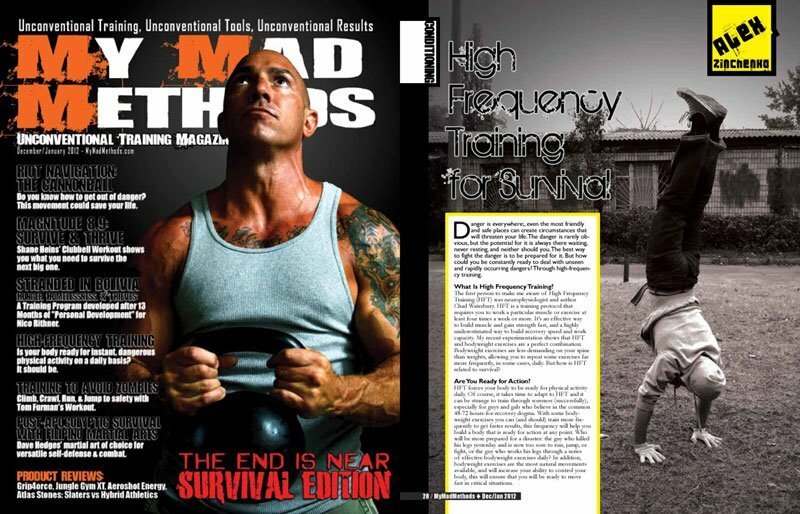 High-Frequency Training is explained at a very high level. And it’s one of the most valuable parts of the book. My personal results with HFT are totally awesome. But it’s a theme for another post. Chad is always innovative in his training methods. He uses total rep count instead of conventional sets x reps, HFT, supramaximal holds, rest-pause etc. You always learn something new from him. As this is a mainstream book, it’s very beginner friendly. If I were just starting, it would have been one of the best books to read first. The part about nutrition is very conventional, which is not a weak point for a person that is just starting dieting. But for me there was actually nothing new. This book deserves a place in the library of every trainee who is serious about his training. No matter what your training experience or goals, you will find something new in this book. Besides, the price is quite low for a 354-page full-color book. Huge in a hurry is one of the best books on the subject of training. This entry was posted in Reviews and tagged alex zinchenko, build muscle, chad waterbury, exercise, full-body routine, full-body workout, gain strength, get ripped, hft, huge in a hurry, men's health, rest pause training, review, rough strength, roughstrength, strength training, training book on 16/04/2011 by Alex Zinchenko.